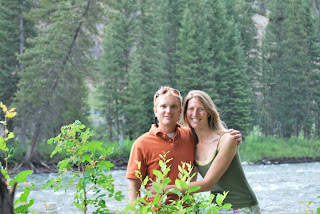 So we went up to Big Sky the last weekend in July and camped out on the river for a three day weekend of biking and eating. All in all a great weekend. Good weather, really good biking, and some pretty good fries. 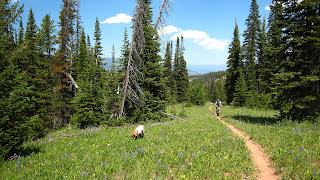 Rode from Ousel falls up trail 162 up to Bucks Ridge and then back out. Fun ride something like 14 miles with around 3500' vertical. Most people seem to shuttle it cutting out some of the climb. At least everyone we met on the trail did. We then found a new bar in the village owned by the same people as the Timbers. 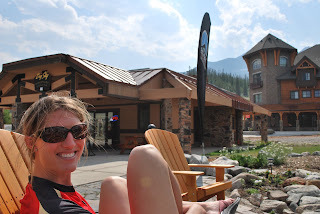 The lady running the place seemed super nice for a Jackson Hole girl. They did have lots of good beer and sweet potato fries. I liked it. We even found our favorite breakfast place the next day with bikes everywhere. Looks like they moved on us, but we found them and I like the new digs. 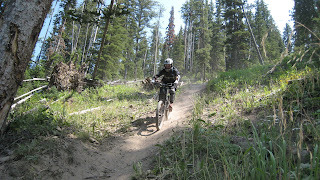 We did some downhill biking up at Big Sky. Claire hated it and while I did enjoy it, I don't think I'd give up trail riding for it. We later got dressed up for a night on the town.....errrrr river. 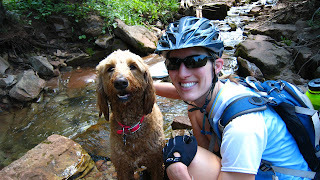 I think Kona likes biking with us. Happy 28th Claire! Idaho 2008 Mountain Bike Trip...done.